David Agbunag was appointed as the Midwest Regional Director of Advanced Practice Providers for USACS at the beginning of 2017. David is a 2017 graduate of the USACS Scholars program. David has been practicing as Physician Assistant for 12 years. He joined EMP 7 years ago and acted as the Lead APP of Doctors Hospital in Columbus, Ohio during the company's transition to USACS. He has been credentialed to act as a mutual aid to other USACS sites in Ohio, including Springfield Regional Medical Center and Summa Health Systems. David is a graduate of Charleston Southern University where he studied Sports Medicine and was a Division One soccer player. He then went on to obtain a Masters degree in Sports Medicine Education at Old Dominion University. 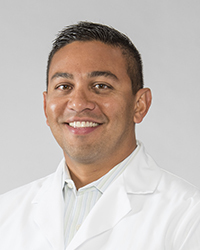 He served as a faculty instructor, clinical coordinator and staff Athletic Trainer at Miami University before returning to his home state of South Carolina to attend Physician Assistant school. He completed another Masters degree at the Medical University of South Carolina in PA studies and worked as a clinical and surgical orthopedic PA for six years. After a short stint of moonlighting at Doctors Hospital ED, he quickly wanted to dive in full-time. "I've served a variety of medical staff positions and found myself truly loving to go to work at DH. We have an outstanding ED team of attending's, nurses and APPs. I've always advised my students to find someone to work with and not for and that's how I have felt here. As an APP at DH, I have the full support of our attending's, always feel part of the team and never feel like I'm stranded on an island by myself". He considers his family is his greatest joy and achievement in life. His 9-year-old son, Luke, 6-year-old daughter, Mia and 2-year-old Josie continue to teach him every day. He describes his wife Tracy, as the rock of their family and soft shoulder to lean on. She possesses a Doctorate in physical therapy and enjoys working in Orthopedics.